Just a two weeks ago I’ve bought new domain and today I can confirm that entire content from old site hosted at wordpress.com has been moved to new site. According to this I would like to share a few thing about this. If you think that this process is difficult you are wrong. Even If you have a lot of posts and your are not IT guy migration process will take just a few minutes! Check this out how to move your site from wordpress.com to own domain. When you are looking for hosting you should check this great site about hosting providers. I was looking for hosting in United States, for some reasons. And for example I thought that company like GoDadday is great solution my new site, but after a few hours spent on reading complaints on the webhostingtalk I’ve discovered again that we shouldn’t trust advertisement… You can find there a lot of great people who knows so many things about hosting! Anyway I found out that there’s a lot of hosting companies which provides excellent solution and I’ve never heard about them!!! Finally I made a decision and I’ve bought my hosting on BigScoots. And It seems that it was a very good choice! As you know I already run site in Poland at http://tszulczewski.pl with polish hosting company, which was obvious choice for me. Now I’ve discovered that I have a better response time from my hosted in US https://tszulczewski.com than hosted in Poland http://tszulczewski.pl. That’s amazing! And one more thing I read many complaints about support from many hosting companies. There’s was no such problem with BigScoots. I just have one question, very simple and just in 10 minutes I get response. Well, I hope that they’ll keep good work. Of course also other engines can be used (see above). 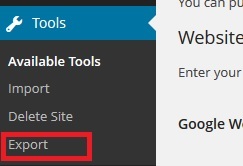 When we press WordPress we will be able to provide path to our exported file. And after that, just in few moments your new site will be ready to use.